When the UFC announced their aggressive anti doping program (and to their credit the most robust in professional sports) they basically acknowledged they are unilaterally moving forward with the program and will cross legal barriers as they arise. The biggest legal barrier? Athlete consent. It seems some athletes simply are not contractually bound by this program which can have far reaching implications on an athletes career, even those simply guilty by association. If true, this is in essence an admission by the UFC that fighters under old contracts (from the date one can assume this would cover at least all contracts that pre date December 2013) are not bound by the current anti-doping policy. 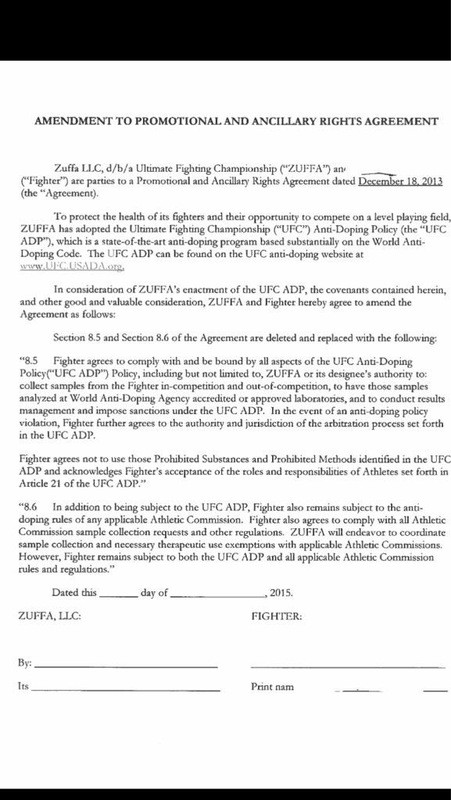 Where things get interesting is what happens to a fighter that refuses to sign this addendum? Any first year law student can tell you that a contract cannot be changed without consent of both parties. If a fighter chooses not to sign this addendum and not be bound by the UFC’s heavy hitting ADP policy they would be within their rights not to so so. The question remains, exactly how many fighters have not agreed to this program and how is the UFC dealing with them?